My cheapness manifests in many forms. I once paid $350 for a tattoo, but complained about the five-dollar tube of healing lotion I had to buy along with it. When I eat at a fast food joint that has a self-service soda fountain, I fill my cup to the top, slurp two or three giant sips, and top-up again before I leave. I am willing to travel miles and inconvenience friends and family just to avoid an ATM fee. But never is my frugality more evident than when it comes to my daily coffee. For years I tried any alternative I could think of to avoid paying someone else to make my coffee. When I first started at my current job, I would drink the office’s low-grade brew. Later, I brewed my own with a single-cup machine, but couldn’t get it to taste right. Then there was my failed experiment with a cheap Target French press. Last year, in an effort get my coworkers caught up in my neuroses, I cofounded an office coffee club. We would all share the responsibilities of buying the coffee, brewing it, and cleaning the machine each day. But we never seemed to establish any sort of rhythm, and after a few months we all gave up. Meanwhile, a new coffee shop called Gregorys Coffee (no apostrophe) had opened up in the previously vacant storefront downstairs from my office building at 40th Street and 7th Ave. Disillusioned by the disintegration of the coffee club, a few of my coworkers went down to check it out and came back with rave reviews. But I held my ground. Still uninterested in overpaying for coffee, I tried my hand at Lipton tea (there’s an unlimited supply in my office), attempting to convince myself that it was just as good. 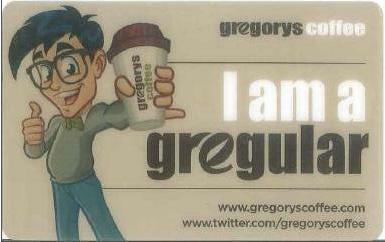 Then one day a coworker came back upstairs after a trip to Gregorys and notified me that he had become a “Gregular.” Gregular status, earned simply by asking for a Gregorys Coffee membership card, means that for every $50 you spend, you receive $5 to spend at Gregorys. Once you cash in your $5 you start over, accumulating another $50. The prospect of spending a little over $2 per cup for coffee twice a day still made me hesitant to try the new place, but the idea of becoming a Gregular—and joining a 10% cash back program—was too good to pass up. My first few trips to Gregorys were uneventful. The coffee was reasonably priced and tasty, pretty much what I had expected. But after a few more visits I started to notice that their commitment to customer service was, well, noticeable. A couple times I even spotted Gregory himself working the espresso machines, tidying up, and offering explanations on his various brews if a customer asked. (I recognized him from his likeness from my Gregular card, above.) To me it seemed that Gregorys should have been drowning in a neighborhood dominated by Starbucks and other better known, longer established coffee shops. Instead, it was full every morning and still busy by afternoon. On nice days the outdoor seating was occupied by office workers and tourists spilled over from Times Square. I had to know more. I found their modest company website and sent an email to info@gregoryscoffee.com, hoping to get in touch with someone—preferably Gregory—who might meet with me for an interview. A half hour later, I got a response from gregory@gregoryscoffee.com, asking when I had some time to talk. Later, we sat down for coffee at the store below my office building. He poured me a cup of my usual “medium-medium” (medium sized medium roast, which he explained had more caffeine than the dark roast) on the house; he had an espresso. Gregory, a.k.a. Greg Zamfotis, is 29. He went to Boston University for business with aspirations of being an investment banker, but changed his mind. He went on to Brooklyn Law School to be a bankruptcy lawyer, but changed his mind again. He didn’t want to sit in front of a computer all day; he wanted something that he could put his name on. Greg’s dad spent his entire career in the food and beverage industry in Manhattan, mostly with delis, but it never interested Greg enough to go into the family business. It was only during a conversation with his father a few years ago—at a Starbucks of all places—that he decided to combine his foodie pedigree with his entrepreneurial spirit and open a coffee shop in New York City. His first location, at 24th and Park Ave, debuted in December 2006. It’s obvious the guy is passionate about coffee—and equally passionate about running a successful business. He splits his time among all three of his locations, often working behind the counter in a fitted white shirt (rolled up sleeves) and a dark skinny tie. He designed the company website himself. He answers his own emails. He has plans to move into a midtown office space in the near future, and has a fourth store set to open in August 2011. And on top of that, he’s literally the face of the company. When I hear Greg talk about the finer points of coffee, I can’t help but think of a wine connoisseur describing the subtle differences between two vintages of a cabernet, or what someone like Sam Calagione of Dogfish Head Craft Brewed Ales might tell me about his 60 Minute IPA versus the 90 Minute IPA. For Greg, it seems to be less about putting Starbucks out of business and more about putting something new out into the marketplace. “I wanted to bring the third wave to midtown,” he says. But if the majority of his customers are “first wave” coffee drinkers (like me) who order medium-mediums twice a day, doesn’t that run contrary to the whole third wave paradigm? He says no. He estimates 85 to 90% of his Gregulars order mostly just basic coffee. And if customers like those are trying to find the absolute cheapest coffee on the block, it won’t be his. (Dunkin’ Donuts and McDonald’s are both within walking distance of his 40th and 7th location, not to mention a fleet of breakfast carts stationed at every corner.) So instead, he says, the plan is to compete by offering great customer service. You might be thinking, Customer service? What a concept! It should come standard with every cup of coffee. But it doesn’t. The archetype of a modern coffee shop employee, as Greg describes him, is the guy wearing a wool cap in the middle of the summer, ignoring the customer so he can brag to the other employees about the latest indie flick he’s seen or the new obscure band he’s into. Of course that’s not always the attitude you’ll encounter, but Greg makes sure you don’t see it in his stores. Even before I met with Greg, I could tell that the Gregorys staff had been trained to handle customers a certain way. On one visit, I reached the front of the line only to find the cashier fumbling with a stubborn roll of quarters. Her manager noticed the line starting to grow and in a polite but firm tone, she instructed the cashier: “Don’t worry about the quarters when there’s a line. Take care of the customer first.” Another time, I accidentally dropped my change into a dish of their complimentary mini biscotti. The cashier immediately snatched up the tainted plate and replaced it with clean cookies. On still another occasion when I was running late for work, I accidentally left a large personal check on the Gregorys counter and didn’t realize it until about an hour later. When I went back to see if anyone had found it, the check was waiting for me behind the counter along with a $10 bill I didn’t even notice I had left with the check. The young staff is positive and enthusiastic and polite for now, but how, I asked Greg, does he keep them that way once that newness wears off? After all, even the most disgruntled employee in the world was probably happy at his job for at least the first month or two. At 29, Greg is around the same age as many of his employees. He appreciates that they have other interests outside of coffee and presumably that understanding has molded his managerial style. Though his is still a relatively small operation, he stresses the import of the distinct company culture at Gregorys. The staff regularly does book clubs and movie nights together. Once a year, Greg closes his stores and takes everyone to Medieval Times in New Jersey. And later this year, he’s headed to Brazil to visit some coffee farms and he has saved an open seat for one of his employees to join him, all expenses paid. To decide who gets to go with him, Greg is holding a contest. Employees can submit a piece of original art—a song, a personal essay, a photograph—with the best entry getting the ticket to Brazil. After speaking to him, it’s hard not to like Greg; I’m rooting for him to succeed. But most of his customers will never have a conversation with him or follow him on Twitter or even notice him behind the counter. Still, it says a lot about Greg that he’s managed to overcome some long odds, against both his competitors and my cheapness. For the record, I still buy all my clothes at outlets and I still hate leaving even a few minutes unused on a parking meter. But I’ll happily pay $4.46 a day ($2.23 in the morning, $2.23 in the afternoon) for my medium-mediums, and I’m proud to call myself a Gregular.